Photo: PATH/Saumu Juma. Health care workers at Uswaa Dispensary in Hai DC Kilimanjaro review different reports at the end of a clinic session. 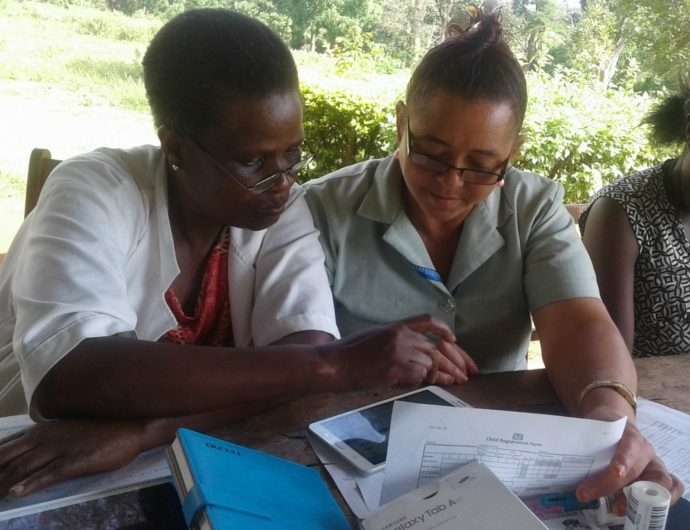 When the BID Initiative first began working in Tanzania to introduce data quality and use interventions alongside the Ministry of Health, Community Development, Gender, Elderly and Children (MOHCDGEC), using data was not an everyday practice for most health care workers (HCWs). 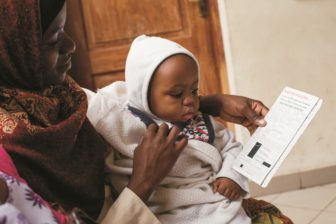 Many were more excited about the new devices such as the electronic immunization registry, than they were about using this information to improve decision-making. After implementing a change management strategy and thorough training led by district officials, HCWs began to realize the value of using data for decision-making. They began asking: Where do I find all the registered and vaccinated children? What should I do if a child misses a vaccine and I have a red alert on my coverage report? And how do I find children scheduled for vaccination the following month? Tanzania is still building a culture of data use at all levels of its health system in which data is valued, sought out, and used as a standard way of working, but it is rapidly growing as HCWs increasingly realize the importance of using this information to influence their decisions and improve the quality of service delivery and health outcomes. Before the introduction of data use interventions, HCWs were mostly concerned about data collection. They were “chasing their deadline,” and largely worried about meeting performance targets. Musa remembers that the paper registries would sometimes go missing. Other times, HCWs rotating into the RCH unit wouldn’t know how to fill out the paper forms and would make errors in the records. Musa, who has been practicing immunization for four years, remembers calculating the balance between registries at the end of the day. Photo: Bill & Melinda Gates Foundation/Riccardo Gangale. A mother and her young child wait for vaccines at the Ngarenaro Health Center in Arusha, Tanzania. Patients are also noticing an improvement in immunization services. But that’s since changed. TImR’s data dashboards and automatic reports help him to reach his monthly targets. When it’s the middle of the month, he starts going through his facility’s monthly plan to identify children who missed their vaccination due date. He then follows up with them to ensure no child misses a vaccination. The data available in TImR isn’t limited to immunization. The system includes other data such as growth monitoring, deworming, and Vitamin A.
Israel Rugina from Mbuguni Rural Health Centre in Meru DC, Arusha believes he is also a data use champion as he’s used weight interpretation reports to address the issue of poor nutrition. His facility has reduced the number of children who are underweight in the villages where outreach services are conducted. In the past, Israel and his colleagues encountered children with abnormally low weights. But it was hard to keep records of these children for follow-up. Data use champions aren’t just found at a facility level. Michael Ndowa is the District Immunization and Vaccination Officer at Hai DC in Kilimanjaro. As HCWs provide immunization services, he can easily see how their stock is being used and when they send requests to reorder stock. Health workers like Musa, Israel and Michael are responsible for the success of data quality and use interventions. Their examples, along with many others, are contributing to a culture of data use in which HCWs use timely, high-quality data to drive planning, performance management, and improved delivery of services.